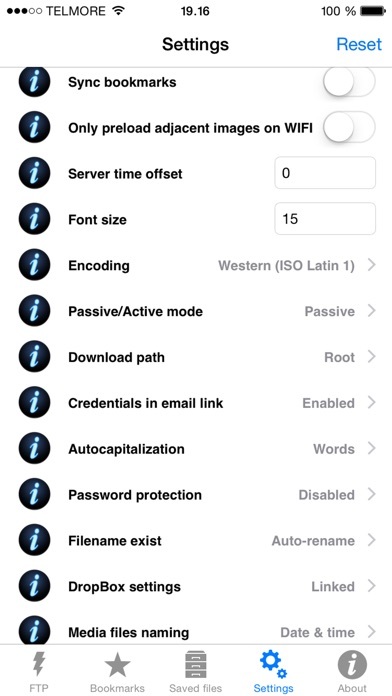 App is great for logging in to various ftp and sftp sites. No issues with the connection or transfer portion. When attempting to transfer subdirectories and their content, it is not possible to select them for transfer. One must also change the destination directory, or all files from the ftp site will end up in the same directory even when one has navigated to a subdirectory on the server. I have several LAN ftp servers and create bookmarks with names for each. Adding bookmarks (saved ftp sites with user and password) is easy. 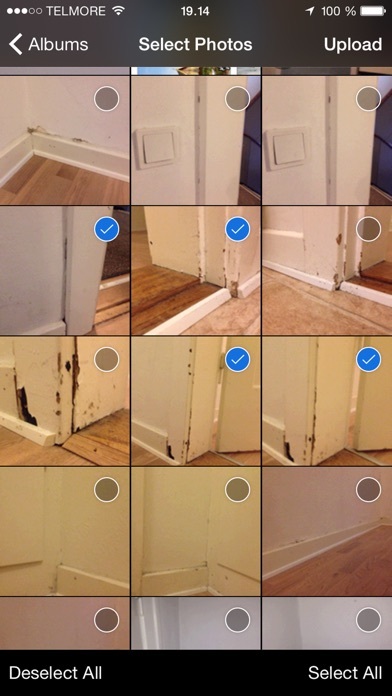 Deleting one or all is easy. Saving and restoring bookmarks in txt or csv format is easy. I have books, pdf files, documents that when downloaded to iPad or iPhone ftp pro pops up a dialog “copy to...” and I get to open the file in the app of my choice. Get this App. It should not be that hard to use SFTP. Should be able to download keys from web to a directory. Then use that key, WITHOUT renaming, in SFTP. I still have not got SFTP to work which is the only reason I bought this app. Does everything I could ask for in an FTP client. Developer is super-responsive with support. I will give 5 Stars for customers support.After going back and forth with email for Apple new update they did solve the problem with new update.All my email was responded within 24 hrs. Bailed me out so many times..
UPDATE: super responsive developer. Found a minor bug - now fixed. 5 solid stars. Old review: After a lot of other FTP Client apps fail over the years, this one just bailed me out *again* when I had to revise html code. Rock solid reliable, intuitive, and functional. By far the best FTP app. On the road FTP Client Pro has all the same bookmarks that I have on my Mac at work, where I use Transmit. Thanks for a brilliant and very useful app! The app is easy to use and is perfect for using my iPad to maintain a website when I'm traveling. The only problem I've had in the last two years I've used it related to a smart punctuation feature introduced by iOS 11 that interferes with coding. Then I discovered the superb customer service that comes with the app -- very quick and helpful, including a simple fix for the problem. Great app! Very reliable and well thought out. A pleasure to use. Best FTP app for iPhone! I've been using FTP Client Pro for a few years now. I need to be able to make website changes when I'm away from my desk, and this app does it flawlessly. When the recent iOS 11 update decided we now need "smart" punctuation, Anders Havn was on top of it. This app honestly has the best customer support I have ever encountered. Works great and great support. Once I figured out the fix for the encoding problem that kept me from saving files was in the app settings at the bottom, not system settings, I learned there are a lot of features and I paid a fraction of what I paid for my pc ftp client. Not only is the app great, at the back end Anders Havn provides prompt support if and when it is needed. Has an encryption, easy to use, but most of all the developer responds to questions and feedback. I had a minor issue connecting and contacted the developer. Got a respons within a day and got it working. Great customer service. Really like the thumbnail functionality for viewing images. Thanks! This is a very high quality FTP app. Lots of features, simple to use, and well worth the price. 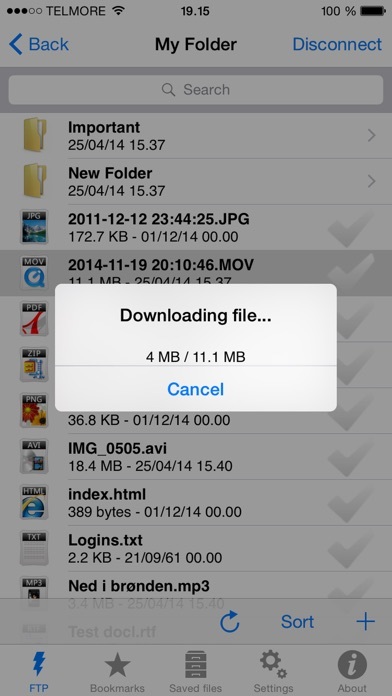 5srar , very stable powerful and job well done app, for ftp. I have been managing websites since the 90s. This app makes it easy to manage files and do quick adjustments to page code from my iPad. For this work it is the Best. App. Ever. Love this App makes my live so easy! Everything I need in an FTP client. Easily manage multiple sites, edit web pages, etc. 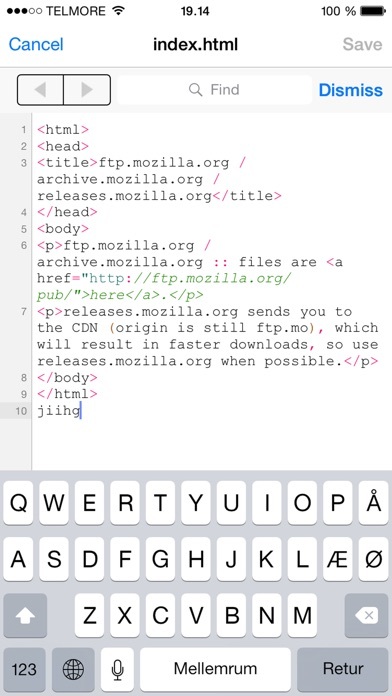 I don't have huge requirements for an ftp app on my phone, but this one is perfect for what I need it for! Once again updating my review as many good features were added in response to previous reviews: Works really good so far on my iPod touch. Very impressive. Well worth the small charge. Displays text/log files for good admin tasks. Combine this with AcePlayer for a powerful set of tools. Moving and renaming files/folders is pretty easy. Love this tool. BEST MOBILE WEBSITE EDITOR APP! We use this to update our website on a frequent basis. At times we aren't able to go on our computer or do not have access to one to process an update so this app makes it very convenient to update and upload on the go. Awesome app!!! Apps like this is what will cause mobile devices to replace laptops and desktops. This app is actually more powerful/useful than the FTP client I use on my laptop. BTW, I did find a bug regarding search and the developer responding almost instantly and resolved the issue. Two thumbs up. I've been happily using it for several years. Very easy to use in my iPad Pro. Great time saver. Don't have to wait till I get back to my desktop. Everything works as promised. Fast email support from developer. I needed SFTP for my server and it also works with private key authentication. Waste of money. I couldn't even get it to make a simple connection to my server. I finally gave up on this one and downloaded a different ftp app which instantly connected. Works as advertised. Easy to set up! I use ftp regularly to manage my server, and this client always connects reliably right away and does everything I need it to. Keeps saying wrong username or password while I'm sure it is right. I use this app about once a month, and its user interface is far away from being user friendly or right to the point. With this app it is always a huge hazzle to find and select the content you want to upload. Forwards and Backwards Navigating in "Saved Files" is impossible: once you are in a sub-folder, there is no back button, there is no way back to its parent folder. I do not recommend this app. Just like using an FTP client on my desktop computer! Life saver! I don't like to spend money on applications but this one is absolutely worth it. Curiously, still can't delete files while using SFTP regardless of encoding choice. Have to ssh in with another app to do that. Dandy tool that does the job, right. More than an ftp client! More like finder. Better even! Not only transfers files between your device and a remote host ( and other ftp commands) but also views nearly anything (renders html ) and edits them too (can be used to maintain web site - totally), zips/unzips files, exports them to airdrop, mail, photo album, iCloud. Very well thought out, easy to use, minimum required host setup saved and modifiable between sessions. For frequent ( picky ) users, settings provide great flexibility, embedded help and explanations very understandable. Author is very responsive in case you can manage to come up with something that is not already explained. Log shows what happened incase the remote host is being difficult. 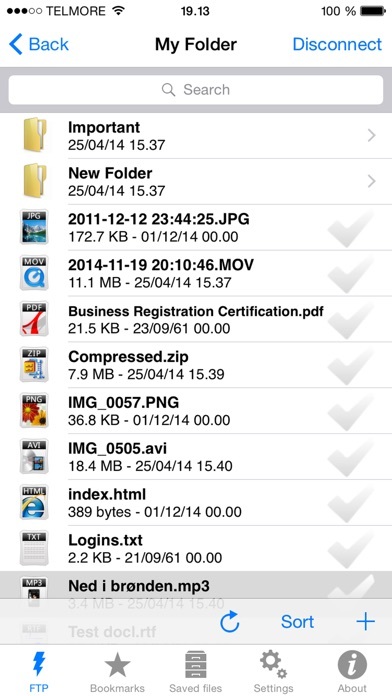 I need to regularly upload ftp files on the go. This app is a lifesaver. Straightforward and no problems. I have used this bus ftp client exclusively for several years. Really good. Works a lot better than expected. The image viewer works top nice! I love this app. Now I don't need to download files to my computer then share it to my phone. I just download the files straight to my phone. What I would like to see: if can have an option that files can be automatically played (play the next file after the first finished playing, so that one doesn't need to go to saved file and click on the next), I'll give this app 5 stars. The customer service is great! !Whenever I have questions, I will write to them and they usually respond within a day. What more could you ask for? The software works as expected on my iPad Pro Simple and Straight forward!